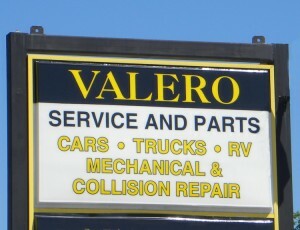 Service at Valero for tune-up, repairs or total customization. Since 1949, Valero Service has been providing a range of services for autos, trucks, vans, police, fire and EMS vehicles, specialty trailers and RVs. Whether you need a tune-up, from basic oil changes to major engine repairs, Valero Service is the one-stop-shop for all you needs. Our experts can examine your vehicle’s entire electrical system to provide maintenance and replace your battery. From new pads to rotors to refilling brake fluid, Valero Service can provide a full range of services for your vehicle’s brakes. With a convenient location and a range of expertise, your vehicle will get the quality service it deserves. We are even open on Saturdays for your convenience. Valero Service is proud to be designated as a Nationwide Blue Ribbon Repair Facility. Our facilities have met a comprehensive pre-qualification screening process conducted by Nationwide's Claims Department. The program guarantees that the workmanship of the repairs listed on the estimate and performed by the facility will be of a quality that restores the vehicle to its pre-accident condition within repair industry standards of quality, safety, and appearance. CARLOAD EXPRESS, INC. Valero Service is please to announce a new partnership with Carload Express, Inc. to maintain their service equipment. A 40 ft. section of railroad track has been laid at Valero Service to accommodate the rail vehicles on site. Valero is now certified for Hy-Rail Inspection. Valero Service is a CEI approved repair facility providing maintenance for various fleet vehicles. Valero handles repairs and maintenance for Schwan's, FedEx, Coca-Cola, UPS and Enterprise for their respective fleets of vans, delivery and service trucks. Valero Service is also a direct repair facility for Farmer's and Traveler's Insurance and an Authorized Repair Facility for Erie and Progressive Insurance. Valero Service has over 50 years of combined experience in repair, service and special customization for vehicles providing unmatched reliability, quality and craftsmanship.